The Virginia Pro Chapter celebrated journalism during the George Mason Ceremony & Celebration Tuesday, June 12. Hosted at the University of Richmond’s Tyler Haynes Commons, about 40 journalists and supporters attended. 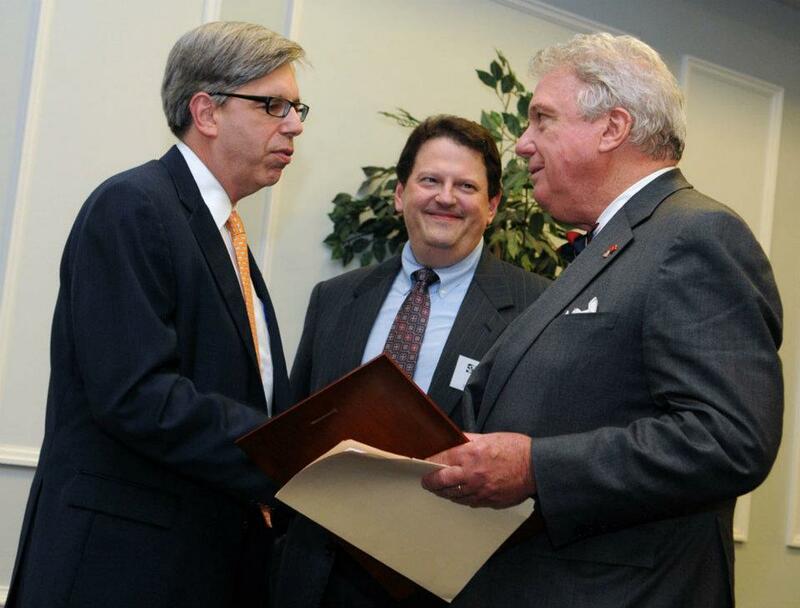 Virginia Pro Chapter Past President Thomas A. Silvestri, left, and Virginia Pro Chapter President Paul Fletcher present the George Mason Award to J. Stewart Bryan III. J. Stewart Bryan III from Media General accepted the George Mason Award for service to Virginia journalism. He discussed his 50-year media career and the tough decision to sell The Richmond Times-Dispatch and other newspaper properties to Bershire Hathaway after generations of family ownership. On the younger end of the career spectrum, two budding journalists were honored with scholarships. John McAuliff from the University of Richmond accepted the George A. Bowles Memorial Scholarship while Vanessa Remmers, a student at The College of William & Mary, accepted the Virginia SPJ,SDX Scholarship. 2012-13 officers are sworn in by Regional Director Brian Eckert. Left to right are Nicole McMullin, Pat Kane, Paul Fletcher, Caroline Cardwell and Guy Lucas. Not pictured are board members Nicole Livas, Daniel Finnegan, A .J. Lagoe, Jeff South, Cara Ellen Modisett, Wayne Farrar, Elizabeth Farina and Robyn Sidersky. 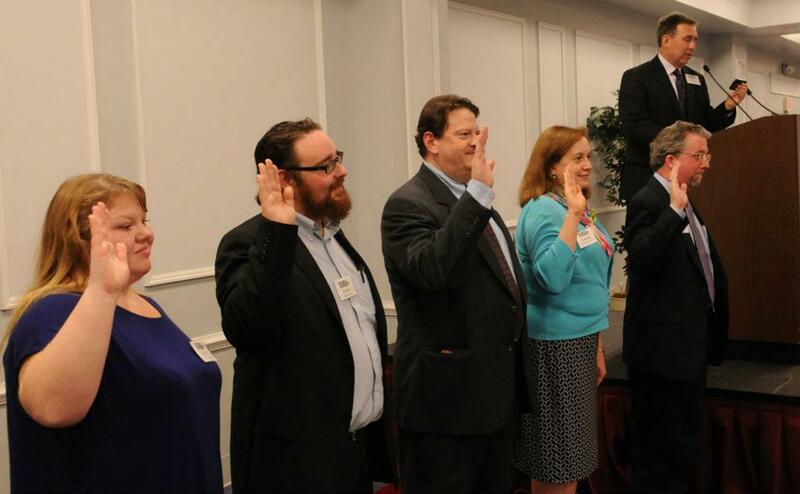 Also during the evening, members of the 2012-13 board of directors were sworn in by Brian Eckert, Region 2 Director. Chapter members for more than 20 years were recognized and presented with plaques. Members and guests raised approximately $450 for the Virginia SPJ,SDX Scholarship Foundation bidding on various items during a silent auction. A special donation of $1,000 for the foundation from the late SPJ National President Alf “Goody” Goodykoontz was acknowledged, also.